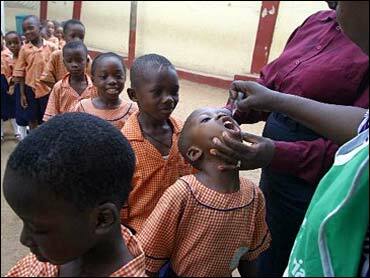 Polio, the dreaded paralyzing disease stamped out in the industrialized world, is spreading in Nigeria. And health officials say in some cases, it's caused by the vaccine used to fight it. In July, the World Health Organization issued a warning that this vaccine-spread virus might extend beyond Africa. So far, 124 Nigerian children have been paralyzed this year - about twice those afflicted in 2008. The polio problem is just the latest challenge to global health authorities trying to convince wary citizens that vaccines can save them from dreaded disease. For years, myths have abounded about vaccines - that they were the Western world's plan to sterilize Africans or give them AIDS. The sad polio reality fuels misguided fears and underscores the challenges authorities face using a flawed vaccine. Nigeria and most other poor nations use an oral polio vaccine because it's cheaper, easier, and protects entire communities. But it is made from a live polio virus - albeit weakened - which carries a small risk of causing polio for every million or so doses given. In even rarer instances, the virus in the vaccine can mutate into a deadlier version that ignites new outbreaks. In 2007, health experts reported that amid Nigeria's ongoing outbreak of wild polio viruses, 69 children had also been paralyzed in a new outbreak caused by the mutation of a vaccine's virus. Back then, WHO said the vaccine-linked outbreak would be swiftly overcome - yet two years later, cases continue to mount. They have since identified polio cases linked to the vaccine dating back as far as 2005. It is a worrying development for officials who hope to end polio epidemics in India and Africa by the end of this year, after missing several earlier deadlines. "It's very disturbing," said Dr. Bruce Aylward, who heads the polio department at the World Health Organization. This year, the number of polio cases caused by the vaccine has doubled: 124 children have so far been paralyzed, compared to 62 in 2008, out of about 42 million children vaccinated. For every case of paralysis, there are hundreds of other children who don't develop symptoms, but pass on the disease. Since WHO and partners began their attempt to rid the world of polio in 1988, officials have slashed the disease's incidence by more than 99 percent. "Eradication is a gamble," said Scott Barrett, an economist at Columbia University who has studied polio policies. "It's all or nothing ... and there is a very real risk this whole thing may fall apart." Aylward agreed the Nigeria situation was another unwelcome hurdle, but was confident eradication was possible. "We still have a shot," he said. "We're throwing everything at it including the kitchen sink."